Blog post by Chris Maskell. Photo by Kristan Toczko. 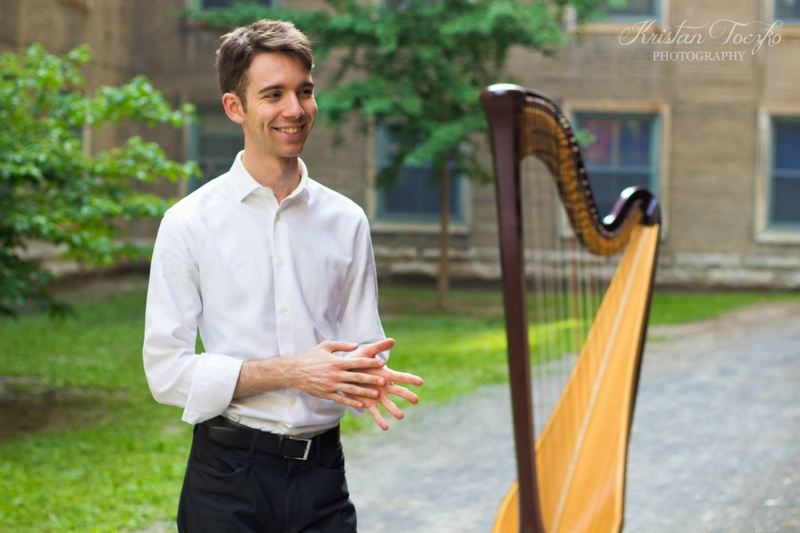 After winning the 2016-2017 McGill Concerto Competition and completing his Graduate Diploma in Performance at Schulich, harpist Antoine Malette-Chénier is set to appear with the McGill Symphony Orchestra next Friday and Saturday night. To learn more about the work he’ll be performing and his experiences learning music in school and more, we spoke to Malette-Chénier in a recent email exchange. Can you speak about the piece that you’ll be performing with the McGill Symphony Orchestra? How does it fit into the harp’s repertoire? The Concerto for Harp and Orchestra, by R. Murray Schafer, is really one of a kind. I have been performing this piece for a few years now, and it has become my utmost favorite harp concerto of our repertoire. If you think of harp music as always being pleasant and relaxing, think again! This is a work full of extremes including bite and force, and beauty and harshness! It's also a very rare opportunity for the audience (and the harpist) to hear an amplified harp trying to play louder than a symphony orchestra! Framed by two very fluid, organic and slightly chaotic movements, the second movement of this concerto is such a treat. The solo harp joins the percussion section to set a spirited and exotic groove, before the whole orchestra joins in on the fun. The composer, Canadian artist R. Murray Schafer, is really someone whose work exemplifies what I love about contemporary music: it’s full of surprises, delightful and impressive textures, and a very organic mix of beauty and ugly-ness. He’s written quite a few books on many subjects, including theater, stage work, music education and performance and sound ecology. If you do not know R. Murray Schafer's music yet, look up his gorgeous works for choir. On YouTube, you can find nice recording of Miniwankas and Snowforms, amongst other pieces. As you also performed Schafer’s Concerto in the final round of the McGill Concerto Competition last year, did you change your preparation process at all for this performance of the piece? I did change my preparation quite a bit indeed, so much so that it now feels like a different piece to me! It's so easy to be "in the moment" and to create something flexible when you play in a duo with a pianist (as I did for the competition.) As a soloist with an orchestra though, one has to make one's ideas clear not only so that they will not only be understood by the audience, but also by every orchestra member playing on stage with me. As any orchestra musician knows, every orchestra is unique, and it's a thrill to hear what Maestro Hauser and all the players bring to this piece. I might have already prepared ideas about what I want to convey as the soloist, but as we’re rehearsing now, I can just react and play with what the other instruments are doing. It keeps me on the edge of my harp bench - I love it! How have you found studying in an academic environment impacts your performance ability? What I have found the most extraordinary during the years that I was fortunate to spend studying harp and Early Music in four different academic institutions, is something that I had not expected at first. I wanted to go to university to receive knowledge from professors and to exchange ideas with professional musicians, but in the end, there was so much more than that! The amount of knowledge and experience held by the student body of any university is beyond measuring and I endlessly try to take everything I can from fellow students. This certainly has fueled my own research (in Early Music and new music specifically), and made it possible for me to try to bring more and more to the stage along the way. What future plans are in the works for you? I consider myself very lucky to be playing for a wide range of projects in the year to come. I love having the widest variety of music to learn on my music stand, which is the case right now! I am playing some more of Schafer's music (obsessed much, you say?) next week for an art exhibition in Montréal, and preparing for a chamber music concert around Debussy, organized by McGill in November. I am also looking forward to play for the Orchestre Métropolitain for their December concert series, as well as with the Orchestre symphonique de Trois-Rivières, where I have held the principal harp position as of a month ago! As I also play different historical harps (including a 200-year-old instrument! ), I am preparing for a concert for the 2017 Festival Bach Montréal, as well as for a project for the Festival Montréal Baroque next June. Hear Antoine Malette-Chénier perform with the McGill Symphony Orchestra on October 20 and 21, 2017 at 7:30 p.m. in Pollack Hall. Tickets can be purchased here.